Growth Mindset, not just meet the monthly cash payments. True entrepreneurs have a growth mindset which says, "Let's make this a 10 billion-dollar company", even though now the company is making only 1 billion dollar in sales now. Passion for the Business. You have to love the business, your business products, your business partners and what your business stands for. Businesspeople run business to make money, while entrepreneurs run business because it their life's passion and they cannot don't do it! Look for New Opportunities. This means making waves and not becoming stagnant. Often the best opportunities come in the form of problems, and true entrepreneurs welcome problems. Like now the biggest problem is pollution, and true entrepreneurs sell products that make people healthier to cope with the pollution. Vision. A vision is a far picture, usually more than 5 years. Because of the far picture, entrepreneurs can see beyond the current pitfalls and problems. They know that any decision make today will impact the business long term. That's why entrepreneurs are so far-sighted, they don't just look at the quarterly or yearly profit or cash flow. A good example of a business with long term vision is Jeunesse Global. The founders, Wendy and Ray, have a vision to do charity, that's why they make big profits and donate the huge profits to charity. Leadership. True entrepreneurs are leaders. They don't just follow the fad or do what's hot now. They lead the market, the industry, customers, suppliers and team members. Most importantly, they lead by example. 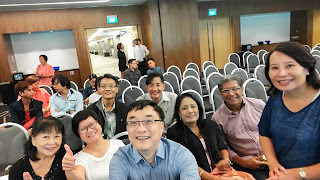 If you too want to succeed in your business, come for a free seminar where you will be taught on how to start and succeed in your own business with less than S$300 capital. The coming talk is on Tuesday 3 November 2015 7.15 to 9.30 pm. Venue is at Suntec City Level 4, Room 404. Text to Andy at 65-8201-4347 or email to hpa88@singnet.com.sg now!